Categories: Certifications, Virtualisation | Tags: VCAP4 to VCP5, VCAP5, VCP, VCP5, vExpert, Virtualisation, virtualization, VMware | Permalink. I’m on the verge of booking it yes. Gregg: do you have a copy of the PPT you showed on yesterdays brown bag? Sure, I’ll try add a link to my VCP 5 page of the presentation although everything and more is on my VCP 5 page. 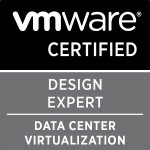 Slight change to the date (rescheduled for 5th od Dec – Today) = VCP510 passed.